Brandt Hiler has always had a passion for helping others. In fact, as a teenager, he began volunteering for a local fire department. Brandt began his career with Muskogee County EMS in 2004 as an NREMT-Basic, and in 2007 he received his certification as an NREMT-Paramedic. Brandt has served the citizens of Muskogee County for 13 years. Brandt is known for his compassion, hard work, and dedication. He remains calm under pressure, and he shows true leadership by quietly going above and beyond and never asking for acknowledgment or recognition. In 2015, Brandt became a Field Training Officer. He says he enjoys helping new employees and co-workers, whether they are beginning their EMS career or transitioning to a new licensure level. It’s the perfect assignment for him, as he is well-known and respected for taking the time to explain procedures and educate others. Brandt’s service and professionalism have been recognized several times with honors and awards. In 2016, Brandt was honored for his service to a pediatric car accident victim. The physicians at the pediatric rehabilitation facility said, “Had it not been for the care that the patient received on the scene of the accident, the patient would not be alive today.” Last year Brandt also received awards for saving the lives of two patients, and he was voted Paramedic of the Year by his peers. Brandt is admired by all who know him, most especially by his wife, Angela, and his children, Kaben and Kendall. When off-duty, Brandt enjoys spending time with his wife and kids, fishing, hunting, and flying. 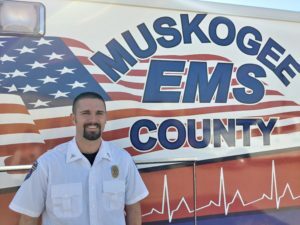 Because of Brandt’s outstanding professionalism and his exemplary performance, Muskogee County EMS is honored to endorse Brandt Hiler for the American Ambulance Association Star of Life Award 2018.